A wonderful experience that enhances one of San Antonio's most important watershed areas by making it accessible for recreation, and functional for sustainable modes of transportation. It also preserves riparian habitat and has positive storm water management capabilities. Leon Creek: Many access points along Leon creek between Loop 1604 and Loop 410. Our Leon Greenway North trail system touches many different parts of town with many different landscapes and peoples. It is unique because of its stout design, its connectivity, its commitment to preservation of riparian landscapes, and its utilization of collaborative public/private partnerships. In many instances, private business has donated land for the project. 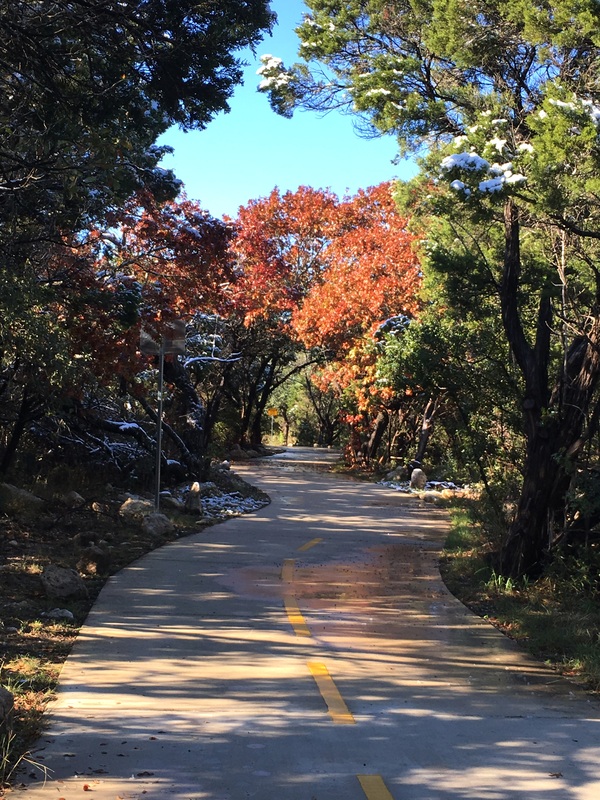 Many people say that they are very thankful for the trail system because it took an underutilized asset of the riparian corridors and made them functional for all members of society. These trails are accessible by persons with disabilities and transect many cultural and neighborhood boundaries, thus bringing diverse people together. We have made many connections to employment centers, shopping centers, living centers, and educational centers to provide recreation, exercise, and alternative transportation opportunities. Safe, alternative non-motorized transport is particularly necessary in this section of town because of roadway congestion. 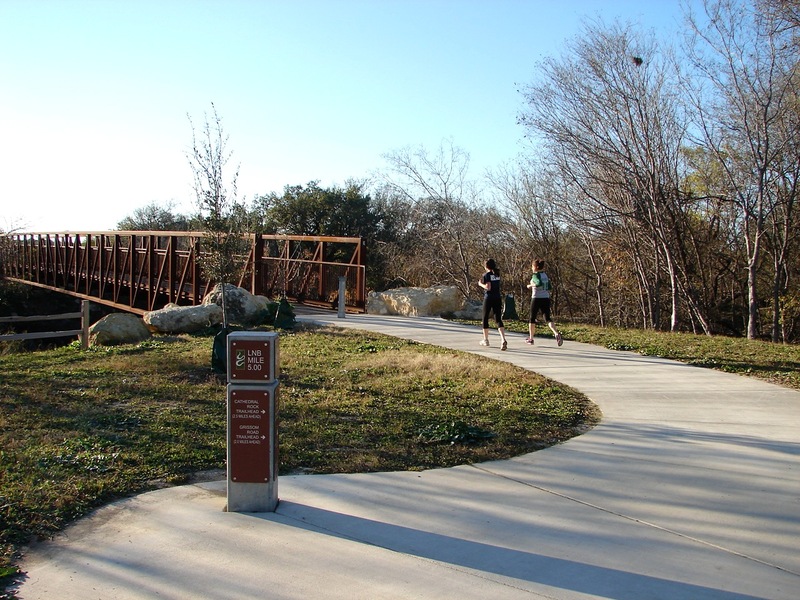 Specific examples of public-private cooperation include a dedication of land for the trail and trailhead from Valero Corporation at the intersection of Interstate 10 and Loop 1604. That intersection has provided very good exposure for the program due to the large traffic counts which go by that location every day. It has also provided Valero Employees with a safe area in which to exercise. Before our trail, many employees would jog before work or during their lunch along several of the busy roads in the area. In many respects, this was an accident waiting to happen. Not only did Valero Employees get a beautiful area in which to exercise but so did the citizens of San Antonio. Working with Valero also provided another opportunity for public-private collaboration. Valero requested that a connection be made between our trail and their main entrance. (Their dedication of land was on the back side of their property.) That got us searching for a suitable place. Because of topographical issues, we were exceptionally limited in where we could possibly make this connection happen. We had the added incentive that this connection to Valero's main entrance would also connect our trail to the University of Texas-San Antonio (UTSA). That potential connection had been missed somehow in the initial planning of the trail system. Since we knew that we could satisfy a major policy objective of tying our trail system into destination points of not just a major employer in the San Antonio area but also a university that has approximately 30,000 students, the opportunity was great but the limitations were huge because of topographical constraints and limited budgets. However, having worked with an adjacent student apartment developer previously on buying 40 acres of flood plain from them for our trail, we approached them again about a narrow (10 foot in places) stretch of land between their apartments that would allow us to connect to UTSA and give Valero employees a safe circuit trail. 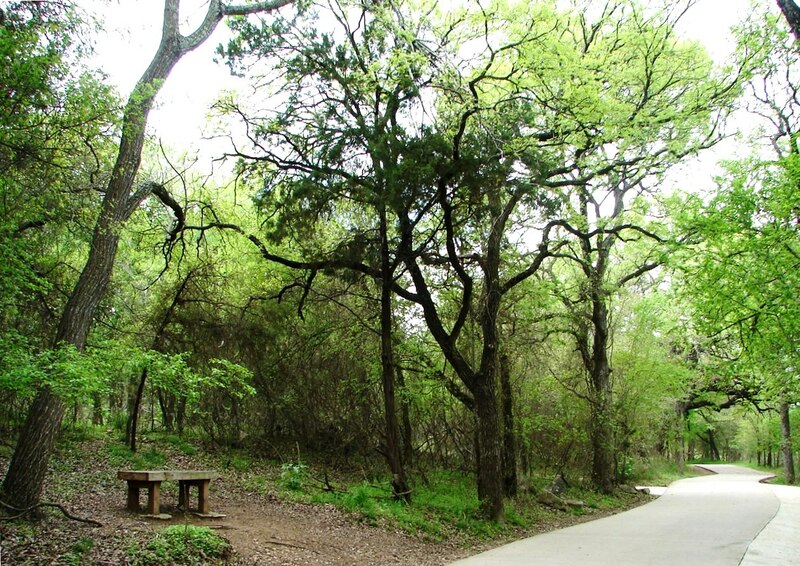 They saw the benefit of giving their residents formal access to the trail/greenway system that stretches for 13 miles and we were able to find a satisfactory solution to them and their bank lender that satisfied our policy objectives without over-extending our project funds. These are two inter-related examples of how working together has yielded very positive results for this greenway trail program and its mission to provide recreation, preservation, alternative transportation thoroughfares, and protect/enhance natural storm water management techniques. There are many other examples of how the public and private sectors have worked together on this successful program. We share these two examples to remind other trail project planners to never be afraid to engage private property owners in the attempt to craft win-win scenarios for them, the project, and most importantly the citizens. By being creative, flexible, and approachable, we have been able to alleviate some traffic congestion in an area which needs it, provide a safe recreational/exercise space to people who use it, protect a beautiful riparian corridor for not just people but also wildlife, protect natural storm water detention and filtration, and perhaps offer a route to university that wasn't available before our project, literally and metaphorically. The most useful trail projects meet objectives that maybe weren't initially obvious, but are so profound that they make many things possible that weren't before. If we were to stress three things that make a trail successful it would be: public-private involvement, connections to destinations people go to, and an emphasis of preserving/restoring natural ecosystems that provide a service that aren't initially obvious but are so profoundly important that life and opportunity are diminished through their omission. We provide this description so that other trail developers can understand what can be achieved and also what is at stake. Young cyclist on Leon Greenway. Photo by Jody Castro. 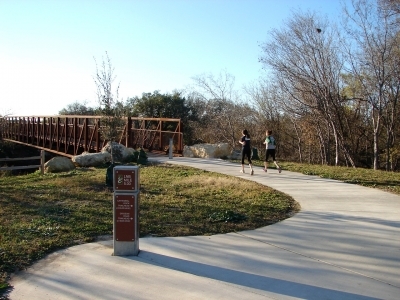 Joggers enjoying a beautiful day on the Leon Creek Greenway near the Via Transit Center Trailhead. Photo by Brandon Ross. Solitary wood bench located along the Leon Creek Greenway. Photo by Adelyn Alanis. 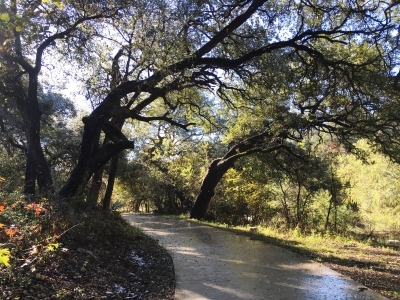 Beautiful leaning oak trees line the preserved Leon Creek Greenway area in urban San Antonio. Photo by Adelyn Alanis. 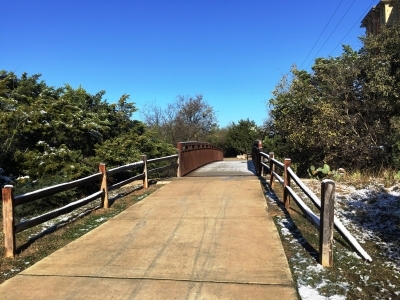 It may be another 30 years before we see snow accumulate on this bridge located on the Leon Creek Greenway in San Antonio. Photo by Adelyn Alanis. Snow is melting from the trees after a rare and historic snow fall event in San Antonio. Photo by Adelyn Alanis.